Just Romantic Suspense: Dreams and Goals and Lists, Oh My! Dreams and Goals and Lists, Oh My! Congratulations to "Tammy Y", the winner of Robin's giveaway. Thank you to all who participated! Thanks so much to the folks from Just Romantic Suspense for inviting me. It's always a great honor to visit. This blog has a sad beginning…but bear with me. Last month something quite sobering happened in my office. A gentleman I'd worked with for several years was visiting family overseas and died of a heart attack. He was fifty-three years old. Fifty three. After the shock and grief waned a bit, I had to stop and process. At one time in my life fifty-three might have seemed old to me. But not anymore. The average life expectancy in the United States is in the seventies according to the tables I reviewed for this article. My grandmother lived well into her 90s. This man lived a little more than half as long as my grandmother. I was reeling at the reality. This sad event also got me to thinking about some practical questions because I'm a practical kind of gal: wills, power of attorney, and all those mundane things in life that I do that only I know about. It's second nature to me…but what if…I think I have some work to do there. While the list-maker in me started on the practical goals, the dreamer in me took over. Carpe Diem—Seize the day! What else do I want to do? In other words, what's on my bucket list? And I realized, my bucket list has always been in my head. So, I'm using this blog today to start a 'real' bucket list. Here are five things I really want to do someday…and now I wonder if that someday shouldn't be after I retire! I want someday to begin soon. Hmmm….I want to visit a lot of places. There's only one way to make those things happens, isn't there? Save some, plan some, and go for it! So, starting today, I'm putting some pennies aside…or maybe the cost of a Starbucks for my bucket list. How about you? I would love to hear from you, dear readers. What are your goals and dreams? What do you imagine? 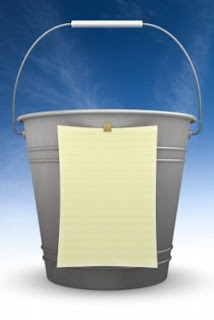 What's one thing on your bucket list and what do you have to do to check it off? Comment and you'll be entered to win a copy of my latest release, Cowboy in the Crossfire from Harlequin Intrigue® as well as trading cards from all my books. running out, the only way Blake can clear his name and save this little family is to confront his own dangerous past— no matter what the cost. A wicked gust of winter wind buffeted Amanda Hawthorne toward the front entrance of her brother's home. She wrapped her flimsy coat tighter around her body and lowered her head. Another cold blast nearly knocked her down. Even the weather fought to keep her out of Vince's house. Well, this freak ice storm wouldn't win, and neither would her brother. He'd be furious, but she was staying. Just until she found another job. She breathed in, hoping to kill the perpetual French-fry smell that permeated her clothes from her final shift at Jimmy's Chicken Shack. She could have lived with the odor and her aching feet, but she couldn't take his octopus hands, his foul breath or his large body trapping her against the wall in his storage room. She shuddered at the memory. She wouldn't go back. But first, she had to face Vince. With a deep breath, she unlocked the door. "Big brother, I've got bad news. You may have houseguests for a while—"
Her voice trailed off. The photos that had lined the entryway hall lay shattered on the tile floor. The small table near the doorway teetered on its side, crushed. "Vince?" Her heart thumped like a panicked rabbit. She ran into the living room. The place was in shambles. "Ethan?" Oh, God. Where was her son? She rounded the couch and skidded to a halt. Vince lay on the floor in a pool of blood, eyes staring up at her, sightless. A hole in his chest, a gun in his hand. Her knees shook and she swayed. No. She whirled around the room, frantic, searching. "Ethan!" she screamed. He had to be here. He had to be okay. He was only five. "Ethan, where are you?" Deadly silence echoed through the house. Her body went numb. This couldn't be happening. Her son was her life. Then she saw it. A small, bloody footprint on the wood floor. Streaks of red trailed across the carpet toward the entertainment center. So much blood. Too much blood. Award-winning author Robin Perini is devoted to giving her readers fast-paced, high-stakes adventure with a love story sure to melt their hearts. Her mission's motto: "When danger and romance collide, no heart is safe." After seven prestigious Romance Writers of America® Golden Heart® finals, Robin sold seven novels within one year. She won the Golden Heart® in 2011, and that title became her first Harlequin Intrigue, Finding Her Son (March 2012). Residing in the southwestern United States, by day, she works for an advanced technology corporation, and in her spare time, you might find her giving one of her many nationally acclaimed writing workshops or training in competitive small-bore rifle silhouette shooting. She is the author of In Her Sights (Montlake, 2011), Finding Her Son, Cowboy in the Crossfire and Christmas Conspiracy (Harlequin Intrigue 2012). In 2013, she begins a new series for Montlake, called Montgomery Justice, and later that year two more books for Harlequin Intrigue set in the fictional town of Carder, Texas. Robin loves to interact with readers. 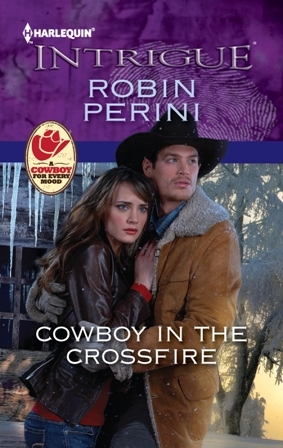 You can read excerpts, read reviews, sign up for her quarterly newsletter and mailing list, and even request trading cards or a Kindlegraph on her website at www.robinperini.com. She's also on Twitter, Facebook, Goodreads and Pinterest. She'd love to hear from you. Giveaway ends 11:59pm EST July 8th. Please supply your email in the post. You may use spaces or full text for security. (ex. jsmith at gmail dot com) If you do not wish to supply your email, or have trouble posting, please email maureen@justromanticsuspense.com with a subject title of JRS GIVEAWAY to be entered in the current giveaway. Thank you for reminding me that there are so many things that I still want to so and accomplish! 5) To live my life so that I have no regrets and be proud of how I lived it! Love your list! What a gift to watch your children follow THEIR dreams...that's a true hero...I salute you! Interesting how we both want to travel...I think that's one of the things we push aside for day-to-day tasks. Good luck on checking off your list! And thanks SO much for stopping by!! I am so sorry for your loss. It is never easy and, unfortunately, I speak fro.from experience. I loved In Her Sights. I cannot wait to read more of your books. Oh Marijane, how very sweet of you. Thank you so much for the sympathy. And I am SO sorry for your loss. Thanks for your kind words about In Her Sights. You made me smile today. I am so sorry for your loss. Loss is never easy and I, unfortunately, speak from experience. I loved In Her Sights and look forward to reading more of your books. Again, please accept my condolenences. My Dad passed away when he was 62. After, that I learned to live one day at a time and never take things for granted. I am very sorry for you loss. Tammy, my sincere condolences on your father's passing. But I think the lesson learned is an amazing one. Never taking things for granted is a great way to live life. I'm so glad you stopped by. Tammy--How great hear from you! I love your bucket list, because family at its best can be such a joy! Congratulations on YOUR wonderful family. And thanks for your kind words about my books! Read, rest and enjoy!!! So sorry for your loss. This is a great reminder to live every day to the fullest! 1) Visit all 50 states in the U.S. (half-way there). 2) Perform at least one selfless act of kindness each day. 3) Raise my sons to be strong, loving, independent men who always treat others with respect and kindness. I love your list, Kate! Visit all 50 states...I'm nowhere near halfway there, but I think that's a fantastic goal. I really admire you for including others on your list. I imagine with a mom like you, your sons will end up being amazing. And those acts of kindness..they'll pay forward in the most wonderful ways. Thanks for stopping by! Congrats on your latest release... really like the sound of it! Welcome, Colleen. Thanks for stopping by. Ooo, Ireland. The pictures I've seen are just beautiful. Disneyland...so fun! Alaska...I'm right there with you! Meeting your soul mate...what a blessing. I hadn't put Ireland on my list...I think I would love to do the British Isles, including Stonehenge. You've helped me add to my list, Colleen. Thanks! And thanks for the kind words about the story! This book sounds like another great one! I've never really thought about what I would have on a bucket list, but you have me thinking. Selling to a NY publisher would have been at the top of the list but Jimmie Joe Johnson: Manwhore just did that for me. So I will think on this and appreciate your giving me a nudge to put a real bucket list together. Good luck with Cowboy in The Crossfire! Gotta love them cowboy types! Thanks for popping by, Lindsey. So excited for your book! Gotta love that title! And yep...I definitely dig cowboys! Nice excerpt. I'd like to travel around the world. Thanks for stopping by. And thanks for the kind words about the excerpt. Travelling around the world sounds so amazing! I hope you get there! I have also been bitten by the question of my mortality. It started when I hit 40 and I looked back and wondered what have I accomplished to my happiness. All of my life, I have done what I have been told and what was expected of me. Now I want to do things that I always wanted but allow other people to make my decisions for me. Yep, I'm stepping out of my comfort zone and tackling my bucket list. Hi Kai--LOVE your list. And you were so specific. GO YOU for already beginning to check things off. I so admire you for taking a look at your life and stepping out of your comfort zone. That takes true courage! I'm cheering for you to accomplish every item on that list!! There are so many things I'd really like to do, but number one is to go to Disney World. I know, I know, I'm an adult (an old adult) but I'd like to play at being a kid again for just a few days as Disney World. Sue...I think this is an awesome dream. Disney World is a place of dreams, and you can be a kid again just being there. GO FOR IT! I'd mostly like to see my children settled & happy. Everything else is the cherry on top. I love that your first thoughts are of your children. Hope you get that and some of those cherries as well! My hubby & I have been saving for an Alaskan cruise for a few years now! And pubbing that book is on my list :) I'd also love to take a photo safari in Africa! Thanks, Jemi! Yep...that Alaskan cruise seems like it would be wonderful! Congrats on going for it! I'm saving up, too! And you're the second person to mention Africa. I think I may have to add that one! Thanks for the kind words on the book and thanks SO much for stopping by! Thanks for sharing, Robin--I think that sometimes those sad losses remind us to take another look at our lives and see whether we're on the track we want to be on... We do have some traveling we'd love to do--I keep thinking it'd be easier if the kids were older, but they're actually plenty old now, and it's time to start making reservations :) My parents have enjoyed quite a few cruises, and have suggested that our whole family might like to try one together--maybe this coming year! Other dreams? Getting through my TBR? ;) That one might happen if only I stopped adding to it! Best wishes for your upcoming trips and all your other dreams and plans, Robin! So glad you're going to make those reservations...and a family one sounds fun. I wondered about a Disney cruise even. LOL on your TBR pile. I can SO sympathize. Thanks for stopping in. I've been so fortunate, my bucket list is almost tough to come up with. I do want to travel a little more, but would like to spend more time in each place: a month in the Scottish highlands, a month in Switzerland, and a two-week train ride across Canada. The fall trip to New England is already booked! The biggest item on my bucket list it to continue to meet wonderful people (like you!) and enjoy every single day. Thanks so much, Sarah, for the kind words about the excerpt. Coming from you that means a lot! I love the idea of staying a long time in the Scottish highlands...just sounds fantastic! Again, another one I may have to add! Oh Robin, I am sorry to hear about your sadness. It sounds like he meant a lot to you! Your excerpt is great. I especially like your opening "A wicked gust of winter wind..."
Please enter me in your draw. I would very much like to read another of your books. Thanks for the kind words about the opening. It's a little different for me, but I'm so glad you liked it! Good luck in the drawing and thanks for dropping by.